Let me start by saying that the products featured in this post were provided to me free of charge courtesy of Crunchmaster.. This post may contain affiliate links, but this in no way influences the review to follow. I have mentioned this in the past that we are a snack house we really love our snacks! The most recent snack that we have begun snacking on is cheese and crackers. There is something very simple about a cracker and slice of cheese. We usually do a sharp cheddar and a white cheese of some sort. As cheese and cracker snack people we are always excited to try different chips and crackers. I have begun also adding meat to our cracker snacks which adds a savory element to a simple snack. I have recently been looking for crackers that are versatile tasting from tuna salad to cheese. Original Multi-seed Crackers – These are the original crackers, and are 100% whole grain, gluten-free and are Non-GMO. The were crunchy and I could taste the ingredients which was a nice change in my crackers. 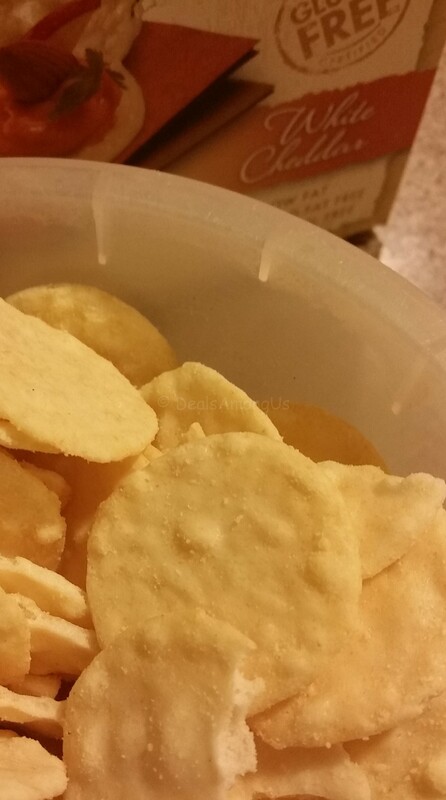 Roasted Garlic Crackers – These are a lighter cracker then the Original flavor. This had an obvious garlic flavor as I could not only taste it, but smelled it upon opening the box. Despite it being garlic, it is not overpowering. Rosemary and Olive Oil Multi-seed Crackers – This was a similar cracker to the garlic flavor, but rather a Rosemary and Olive Oil combination. This was similar also to the garlic in the sense that the Rosemary was there but not in an all-powerful way. Baked Rice Crackers – White Cheddar – This was a nice baked cracker that seemed to have the white cheddar baked in and dusted on the outside. I am overall unfamiliar with baked crackers and this was a nice introduction to their baked variety. Since these are oven baked crackers they are free of saturated fats and are cholesterol free. The Crunchmaster crackers contain sesame, quinoa, flax and amaranth seeds all of which you can taste in each bite of Crunchmaster products. These are thinner crackers which means that you are able to taste the textures and grains contained there-in. These crackers do run a little on the drier side, so keep that in mind when you decide to pair them with something. I really enjoyed trying these crackers and while they were not quite what I anticipated they were still a nice tasty surprise. My father and mother-in-law are cheese and cracker fans and this may end up coming with us our next trip over there. GIVEAWAY: Crunchmaster is giving one variety pack to 1 person! (1) lucky winner will be selected at random to win a Crunchmaster Variety Pack which will include an assortment of 6 varieties of Crunchmaster crackers. I will be randomly choosing 1 person on January 5 (1/5/2015) to receive this variety pack! Open to residents in the US. To enter complete the entries below! Winner’s will be notified by DealsAmongUs by email and prize will be fulfilled by Crunchmaster. Remember you have 48 hours to claim prize, or I will choose another winner. GOOD LUCK!!! Win a Crunchmaster Sampler Pack! 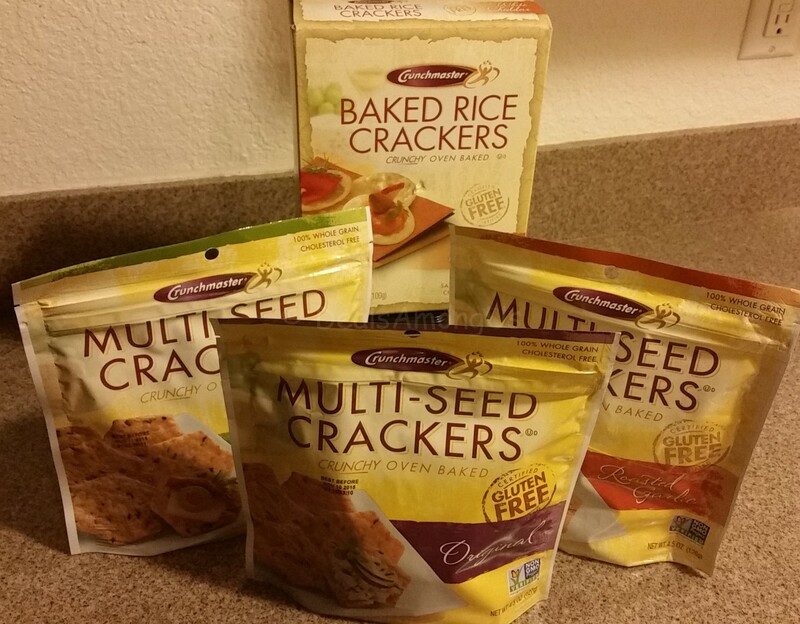 This entry was posted in Food and Drink Products, Giveaways, Gluten-Free, Reviews and tagged craft snacks, Gluten free, non-gmo, product review, snacks on December 5, 2015 by Jennifer. i love Gouda on the Original Multi-seed crackers, wonderful combo. I like Manchego Cheese and a slice of pineapple instead of a cracker. My favorite cheese and cracker is Hickory Farms smoked cheddar on Triscuit Original Thin Crisps. Captain Lance wafer with cream cheese and chives. I like Ritz crackers with Laughing Cow cheese. I love Sharp Cheddar with Wheat Crackers! Trisuits, Wheat Thins, Saltines, I’m always switching up crackers and love them with sharp cheddar. I would love to try these. My favorite cheese is cheddar cheese with ritz crackers. I’m big on Ritz crackers topped with sharp Cheddar cheese! easy What is your favorite cheese and cracker? I love wheat thin crackers with provolone cheese. I like wheat thins with smoked Gouda cheese! I like smoked gouda with crunchmaster multigrain crackers. I like extra sharp cheddar and multigrain crackers! Yumm! Favorite cheese is Scandic Farm cheese with Wasa Crackers. I like wheat thin crackers with garlic cheese spread. Brie w/ sesame water crackers. I like swiss cheese on a multigrain cracker. My favorite cheese is swiss and my favorite cracker is rye triscuits. I like Club crackers with Colby jack. Wheat Thins with Bacon/cheddar dip. My favorite cheese is Cabot Sharp Cheddar Cheese & my favorite cracker is Ritz Crackers! i love cream cheese and wheat thins yummy!!!! Wheat Thins with Sharp Cheddar! I like extra sharp cheddar on ritz crackers. Chicken and Bisquit and Cheese in a can. I like pita crackers with sharp cheddar. i love a whole grain type cracker with lots of crunch, and cheddar cheese! I love sharp cheddar cheese on the Crunchmaster sea salt multi-grain crackers. I like Ritz crackers with cheddar cheese. My favorite type of cracker is Ritz crackers. My favorite type of cheese is sharp cheddar ! I love Colby Jack cheese with Ritz crackers!! I love Chicken in a biscuit with monterey jack! When I want a crunchy, salty snack, I’ll try pepper jack crackers.